There are moments in pop-music history where everything just clicks. Veteran musicians suddenly hit their stride. Long-toiling songwriters hit some undiscovered new level. Styles cohere into sounds. All of those things happened in Philadelphia in the early ’70s, when Kenny Gamble and Leon Huff’s sound fully flowered. Gamble and Huff had been working together for years, and they’d launched a few failed record labels. But when they started their Philadelphia International label in 1971, the pieces fell into place. Long-toiling journeymen became stars, and an entire soul-music sound — lush, slick, welcoming — emerged. Gamble and Huff’s first #1 single, “Me And Mrs. Jones,” came from Billy Paul, a nightclub lifer who’d been putting out singles since the early ’50s. And their second came from a weary R&B group who, just a year before, had been on the verge of fracturing. The O’Jays had been around for 15 years before they hit #1. The group had come together in 1958, when all five members were high school students in Canton, Ohio, 400 miles from Philadelphia. They went through a couple of different names — the Triumphs, the Mascots — before settling on the O’Jays, naming themselves in tribute to the Cleveland R&B DJ Eddie O’Jay. The O’Jays released their first single in 1960, and they charted for the first time with 1963’s “Lonely Drifter,” which peaked at #93. All through the ’60s, they toured tirelessly and cranked out singles, some of which became minor hits. Before signing on with Gamble & Huff, their biggest hit was 1965’s “Lipstick Traces (On A Cigarette),” which peaked at #48. By the early ’70s, even those minor hits had dried up. Original members Bill Isles and Bobby Massey left the group, leaving the remaining members as a trio. They thought about packing it in. Instead, they signed on with Philadelphia International. This was a good move. 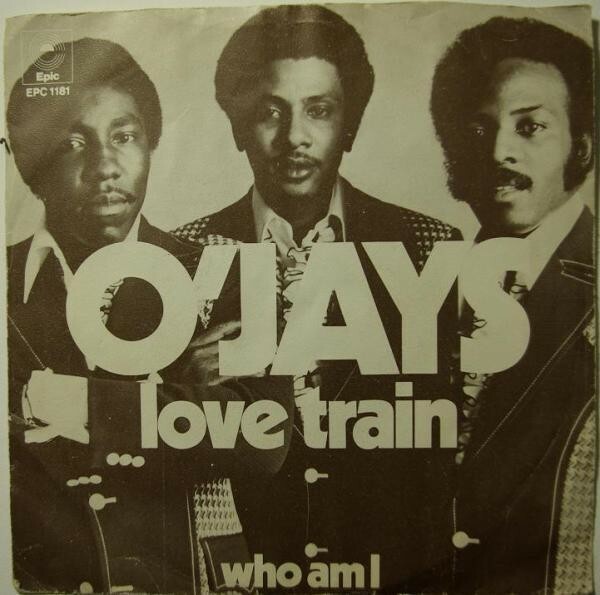 “Love Train” remains the O’Jays’ one and only #1 hit. But compared to the majesty of “Back Stabbers,” “Love Train” feels like an afterthought. “Love Train” is the last song on the O’Jays’ Back Stabbers album, and Eddie Levert has said that Kenny Gamble wrote the lyrics in about five minutes. Those lyrics work in stark counterpoint to what the group had been singing about on “Back Stabbers.” “Back Stabbers” was a paranoid vision, a warning that the people you call your friends will be happy to destroy you if they see you succeeding too much. But “Love Train” is optimistic to the point of absurdity. It’s a fever-dream image of world peace, a utopian invitation. It imagines a future where people all over the world join hands. “Love Train” isn’t a disco song; disco hadn’t yet become a genre. And yet you can hear disco coming, like the rumble of a train further down the tracks. The musicians in MFSB, the Philadelphia International house band, play a fast, pulsing beat — not the four-four stomp of disco, but not that far off, either. And they pile orchestral frippery all over it: Tingling vibraphones, rubbery bass, chugging horns, spiraling strings. It’s impressive, but it’s a bit chintzy, too — the musical equivalent of a pretty-convincing forced smile. As luck would have it, “Love Train” made it into the top 40 in the same week that the Paris Peace Accords were signed, marking the official end of the Vietnam War. The song hit #1 two months later, just as the last American troops were leaving Vietnam. So maybe the success of “Love Train” marked a brief moment of national optimism, a fleeting hope that things could be better. Or maybe it was just a catchy song, from a veteran group who were finally getting their due.